A May 1957 issue of Life magazine recognized five “Women Artists in Ascendance,” painters who had “won acclaim not as notable women artists but as notable artists who happen to be women.” Photographs of the select group illustrated the article, including one of Nell Blaine sitting in her sunny New York studio surrounded by still lifes and large-scale figural works. Those canvases testify to Blaine’s decades of experimentation—from naturalism in her early efforts, to radical abstraction throughout the 1940s, and back to figuration in the 1950s and beyond. This constant search for stylistic renewal characterized Blaine’s sweeping, successful career. The death of her mother at a young age, the volatile temper of her father, and the conservative religiosity of her stepmother marked Blaine’s upbringing in Richmond, Virginia, during the Great Depression. Severe vision problems—Blaine was born cross-eyed—further compromised her youthful stirrings toward art. Corrective surgeries liberated her from physical restrictions, and, by the age of sixteen, she had enrolled in the School of Art of the Richmond Professional Institute (now Virginia Commonwealth University), learning under the tutelage of Theresa Pollak and Worden Day. At Day’s urging, Blaine set out for Hofmann’s studio in New York in 1942. Although perpetually constrained by tight finances, Blaine felt like “a bird out of a cage” in New York. Nurtured by Hofmann’s emphasis on organic rhythms and the rectilinearity modeled in Mondrian’s images, Blaine moved from abstraction to non-figuration. At the Jane Street Gallery, an artist’s cooperative founded in 1942, she adhered to purely formal art and developed an abiding love for jazz. In 1944, she joined the American Abstract Artists group, as did many other students in the Hofmann circle. Blaine’s radical investigations attracted the attention of critic Clement Greenberg who enthusiastically singled out her Great White Creature as “best in the show” at the annual exhibition of the American Abstract Artists in 1945. On Greenberg’s recommendation, Blaine was invited to participate in Art of This Century: The Women, Peggy Guggenheim’s second landmark exhibition of women artists, held in 1945. The closing of the Jane Street Gallery in 1949 and an ensuing trip to Paris in 1950 prompted Blaine’s realization that non-figuration deprived her “of some wonderful sensuous pleasure with painting,” and she gradually re-embraced representation. Blaine’s paintings of the 1950s track her thematic and stylistic shifts; she focused on studio interiors and portraits, but also produced luminous landscapes in brilliant, animated colors depicting her travels to New England, Mexico, Italy, and Greece. While working on the Greek island of Mykonos in 1959, Blaine contracted bulbar-spinal polio. The virus paralyzed her, necessitating an arduous rehabilitation and the exertion of enormous will to return to painting. 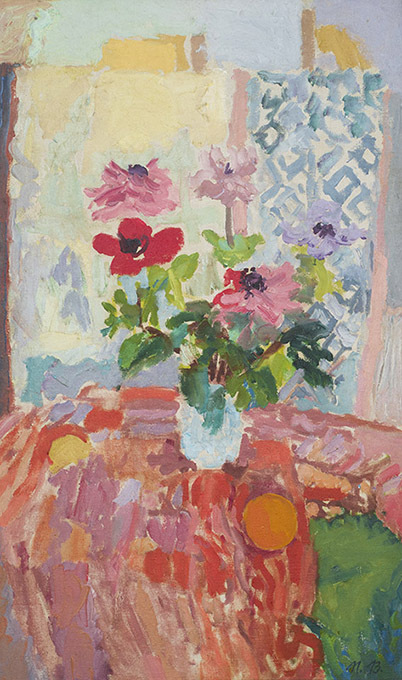 Undaunted, Blaine modified her approach and focused on smaller compositions like Anemones with Red Cloth.